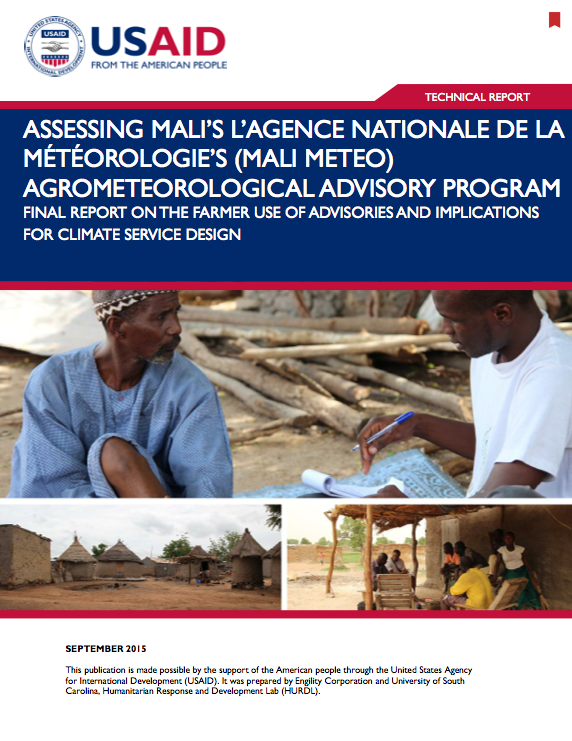 This report (download available in right-hand column) marks the completion of the first detailed assessment of the function and impact of an operational climate services for development program, Mali’s L’Agence Nationale de la Météorologie’s (Mali Meteo) Agrometeorological Advisory Program. Viewed within both the climate services and development communities as highly successful, the Agrometeorological Advisory Program had never been independently assessed. In 2011, USAID’s Office of Global Climate Change commissioned this assessment to understand how the program functioned, and the degree to which the program impacted the lives and livelihoods of the farmers it was designed to benefit. A preliminary report (Carr, 2014) compiled findings on the history and administrative structure of the program, assessed the scientific basis of the advisories, gauged the level of use of the advisories and, where they were being used, the impact of the advisories on livelihoods decisions and outcomes. Among the most important findings of this report were extremely low overall rates of advisory use, with women often lightly engaged with the advisories, if at all. This final report incorporates a new round of qualitative field data from southern Mali to explain the patterns of use, both the low rates of advisory use overall, and the differences in advisory use seen across different social groups in southern Mali. These findings are critical for advancing the use of climate services in development. These findings will help inform the design, as well as the future monitoring and evaluation, of climate services aimed at development goals. This report confirms the low rates of advisory use, and the extremely low rates of women’s advisory use, identified in a preliminary assessment of the program. Between the preliminary report, and the findings of this report, it is clear that in most communities less than 20% of those with access to advisories are using them. The principal factor shaping advisory use appears to be access to draught animals and agricultural equipment necessary to respond to advisories. The advisory program works best for farmers who are located in relatively stable agroecologies, and in livelihoods zones where the marketing of crops is a common activity. In the southern- and westernmost parts of Mali, rates of advisory use among those with the necessary livelihoods assets ranged between 40% and 50%. This program has the lowest uptake among those farming in marginal environments, who we might assume are in the greatest need of advisories. While access to livelihoods assets is an important determinant of advisory use, so too are the roles and responsibilities that emerge at the intersection of seniority and gender. Women’s rates of use were consistently less than half that of men, and usually women were not using the advisories at all. The socio-cultural values attached to livelihoods activities and decisions have significant impacts on the use of climate services. In southern Mali, livelihoods decisions additionally incorporate identity-appropriate roles and responsibilities that shape participation in livelihoods activities. In short, the basis upon which different livelihoods decisions are made are typically wider and more complex than often considered. By themselves, climate services are unlikely to trigger widespread changes in livelihoods activities or outcomes. Currently, given the social structures of agricultural livelihoods in southern Mali, the wealthiest men in any given community are the most able to use advisories. Therefore this program benefits the already-rich. It is unclear if the benefits of this program indirectly trickle to other, less wealthy members of the community, and it is unlikely that these men would welcome challenges to their authority. Effective climate services must fit themselves into the world of the user to allow for their uptake. Beyond the obvious politics of wealth that might shape the adoption of new climate services described above, to alter the structure of agricultural decision-making in rural parts of southern Mali is to fundamentally rework the world in which the farmer lives, and that farmer’s place in the world. Therefore, farmers are more likely to embrace services that work within the existing structure of livelihoods, culture, and society. There are opportunities to use carefully designed and targeted climate services as catalysts for changes in livelihoods and livelihoods outcomes. Well-designed climate services, while speaking to the current socio-cultural context that shapes their use, can identify opportunities to catalyze social change by looking for individuals and situations that present exceptions to sociocultural expectations, and therefore opportunities for social and livelihoods change. Combine future climate services efforts with agricultural development programs that enhance the livelihoods and agricultural assets of farmers. The current Agrometeorological Advisory Program is employed by a significant number of asset-rich farmers in the southernmost part of Mali. Combining future climate services efforts with programs that enhance the livelihoods and agricultural assets of a wider segment of the population would likely result in higher uptake of the advisories. Advisories addressing the future state of forage for animals should be introduced to better meet the overall needs of populations in arid and marginal agroecological zones. In these zones, the utility of existing advisories wanes because the wealthiest members of the community most able to use the advisories appear to shift from agricultural toward pastoral livelihoods. The Agrometeorological Advisory Program should seek out women who are already transcending these expectations in their lives and livelihoods to identify opportunities for new climate services. Women’s use of advisories is very limited due to deeply held understandings of their appropriate roles and responsibilities. To engage women in the use of advisories, future climate service design efforts should explore how these women illustrate pathways to social and livelihoods change that could be supported by weather and climate information. Any future climate services issued by the Agrometeorological Advisory Program should first be vetted with farmers of different asset wealth, gender, and seniority to understand who would benefit from that information, and who would be disadvantaged. This will prevent the design of services that have no constituency as well as services that promote conflict within communities, families, and households. Ideally, such a process would be iterative, allowing representative farmers to play a co- constitutive role in the design of the services and thereby improving their future uptake. Climate services should be coordinated with other development programs and interventions to build mutually-reinforcing programs that more robustly address the targeted challenge than would be possible as stand-alone interventions. Climate information is only useful if the intended users can act upon the information provided. Climate services produce uneven benefits in target populations. Because their utility is predicated on the ability to act on the information they provide, climate services will often disproportionately (or more directly) benefit the wealthy and the powerful in the user community. This may not always be a problematic outcome, especially in situations where the rapid augmentation of farm production or economic activity is needed to alleviate an acute stress such as famine or post-disaster recovery. However, those working with climate services for development should design programs and build expectations for outcomes with this in mind. The design of climate service programs and specific services must assess social expectations and roles among user communities if they are to design sources of information that are salient, credible, and legitimate to the intended users. Even among those with similar levels of access to livelihoods assets, the ability to act on climate services is deeply embedded in sociocultural expectations of livelihoods and the roles different individuals should play in livelihoods activities. Climate services can serve as tools for social transformation, but this will likely be effective only if such services leverage and support existing indigenous/local efforts to transform society or livelihoods. Social roles and responsibilities are deeply embedded in local cultures, and manifest themselves in activities that transcend agriculture and livelihoods. They are not easily changed. Agents of social change in the target population, such as male farmers who decide to plant a “woman’s crop” because the changing agroecology warrants it, or women who decide to head their own households and earn more money than their husbands, have already charted a path to change. Climate services programs can and should build on these pathways to catalyze new livelihoods outcomes.